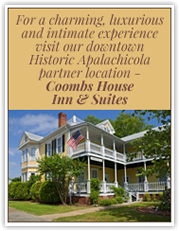 Approach the Apalachicola Bay from the Gulf Intracoastal Waterway. After passing under the St George Island Bridge, the ICW makes a 90 degree turn to starboard, heading toward Apalachicola located at Mile 350 EHL. Water Street Marina is on Scipio Creek only four blocks from downtown Apalachicola and within walking distance of 15 restaurants.